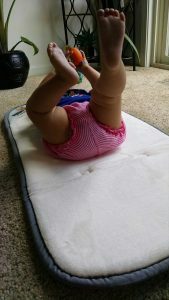 Squishy Mats Review by Annette Yen | Updated: Squishy Mats - for babies, kids, adults, and even pets! I just got a Squishy Mat in the mail today. And it really is, well, squishy! This particular one is the soft baby changing mat and it's easy to carry and super comfy for mom and baby on the go! I love the super soft top - kind of cuddly and you could even use this for a younger infant to sleep on the floor when visiting with friends for coffee. It's made with a layer of memory foam and a super soft cover. Pretty easy to clean and super nice quality. We have about 8 friends, currently, that have new babies ranging in age from newborn to almost a year. I'm keeping this great mat close at hand for their visits. It's machine washable and easy to spot clean if needed too. Who can use a Squishy Mat? Sitting on the floor gets uncomfortable for anyone! These soft spots encourage parents, grand-parents and caregivers to linger at eye level with little ones, and make a nice buffer between all bottoms and the hard floor or ground. Take a Squishy Mats to an outdoor concert, baby yoga or your older kids' sporting events, and the whole family can gather there in comfort. What is a Squishy Mat? Squishy Mats contain almost one inch of Memory Foam - also known as the low resistance polyurethane foam developed by NASA in the 1960s. The surface of each mat is covered by a super soft, micro-flannel fabric and is backed with a nonslip rubber grid. Each mat is durable, sturdy and designed for life on the move. 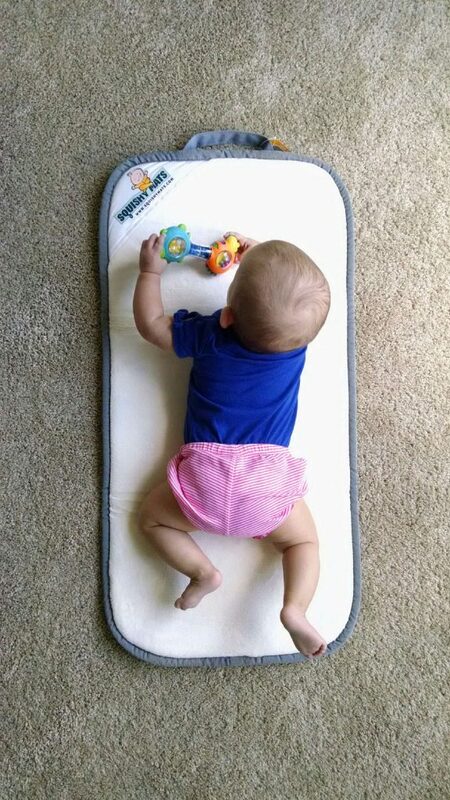 Squishy Mats come in three sizes: 16x32" Changing Mat - folds and fastens with a carrying handle. 3x3' floor mat - folds and fastens with a carrying handle. 4x4' floor mat - folds and fastens with a carrying handle. How does it feel? In a word, SQUISHY! Memory Foam is known for its use in mattresses, pillows and even some shoes; it has incredible give and easily returns to its original shape. You and your child will love the luxurious feel of the minky micro flannel top as it glides under your fingers. With nonslip rubber backing, your child won't get wrapped up as he plays, and it won't slide out from under baby if you (or your pet) step on it! Con: Memory Foam. The jury is still out on whether or not this is a safe product for long term use? I received a Squishy Mat directly from the company in exchange for an honest review. I wasn't compensated for this review in any other way, nor was I required to leave a positive review.